LG is something of a quiet player in the mobile market, but that could be set to change with the launch of the LG V20 -- the first smartphone to ship with Android 7.0 Nougat pre-installed. Announced just hours ahead of Apple's iPhone 7 event, LG's new flagship handset boasts more than just the very latest version of Android. There's a 5.7-inch, 513ppi screen which is supplemented by a secondary 160 x 1040, 513ppi ticker display. On top of this there is a 3,200 mAh removable battery, dual rear cameras, all powered by a Snapdragon 820 processor and 4GB of RAM. The secondary display -- dubbed, funnily enough, Second Screen -- borrows an idea from the Galaxy Edge, providing extra space to display notifications. The front-facing camera is a wide-angle 5-megapixel affair, while on the rear you'll find a 135-degree wide-angle sensor as well as a 16-megapixel 75-degree sensor. 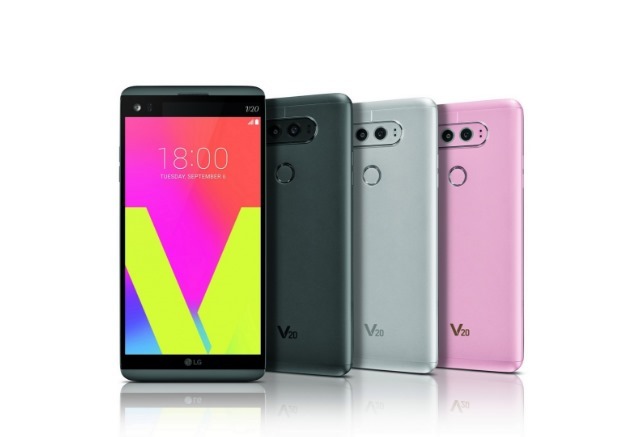 The V20's body is constructed from an aluminum/silicon alloy called AL 6013 which is rugged enough to earn the handset a military rating of MIL-STD 810G. Not only is the smartphone's battery removable (and powered by a fast-charge supporting USB-C port), but the 64GB of UFS storage can be expanded thanks to the inclusion of a microSD slot. Dimensions-wide, the V20 measures 159.7 x 78.1 x 7.6mm and weighs 174g. Audio has been taken care of by Bang & Olufsen, and no less than three microphones cater for audio recording. Oh... if you were wondering, LG has NOT ditched the headphone port. The phone launches in South Korea in titan, silver and pink later this month, while the titan and silver model will find their way to the US after this.